Take That band members have been reunited to watch a documentary on the group but were snubbed by their most successful member - Robbie Williams. Williams decided to stay put in his Los Angeles home, rather than meet fellow members of the former boy band, who split up almost 10 years ago. A behind-the-scenes documentary of the group Take That... For The Record is being broadcast on ITV1 on Wednesday. It coincides with the release of a greatest hits CD and DVD. 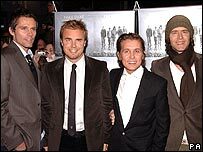 Former members Jason Orange, Gary Barlow, Mark Owen and Howard Donald were pictured at the launch of the album, entitled Never Forget - The Ultimate Collection, at the Coronet Cinema, in London's Notting Hill. They were Britain's biggest boy band, notching up six number ones and 10 million album sales. Their hits included Relight My Fire, Could It Be Magic and Back For Good. 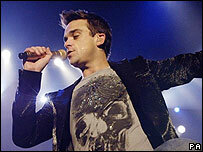 Robbie Williams walked out on the band six months before they called it a day. Gary was tipped as the one who would go on to a successful solo career. But it was Williams who became a global superstar. Explaining his absence, the singer's spokeswoman said: "Robbie has been working hard promoting his new album and is having a well-deserved rest at home in LA before he releases his second single." Speaking at the reunion band member Mark Owen said: "It would have been great to have had Robbie here tonight, but we were really glad he was involved in the documentary. "I know Rob left early, but our memory is of us as a five, and I wouldn't have liked it if it was just us four."